First up is the Syber Vapor SLIM, which is still very much a prototype at this time. As you’d expect from the name, the Syber Vapor SLIM carries most of the features of the original Syber Vapor, but is significantly more compact. In order to achieve this, Syber is using a custom graphics card outfitted with a mobile graphics GPU rather than a standard off the shelf desktop graphics card. 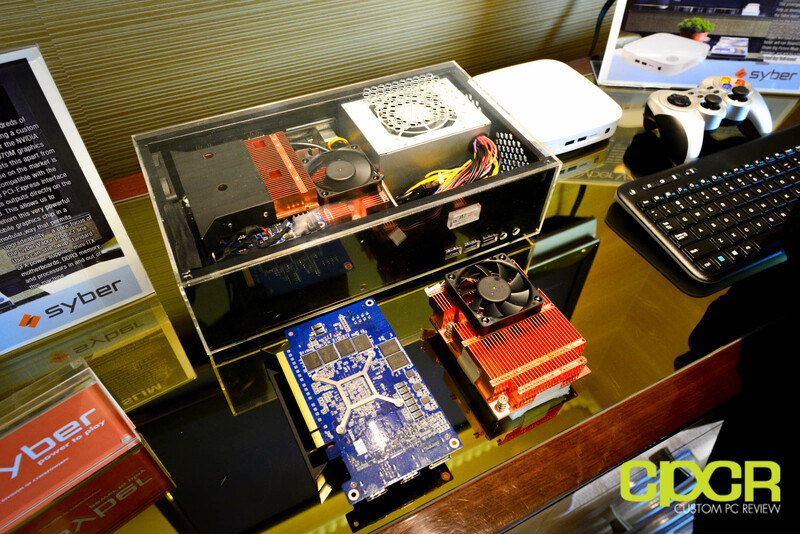 They’ve also got a custom CPU cooler as well since cooling is paramount in a smaller chassis. As a result, Syber is able to fit an Intel Core i7-4790K, Nvidia GeForce GTX 970M, 8GB DDR3, 128GB mSATA SSD, and more into a chassis only about half the size of the Syber Vapor Extreme. Considering the Syber Vapor Extreme is already tiny compared to systems in its class, the Syber Vapor SLIM is very impressive if they can pull it off. Additionally, development for the Syber Vapor SLIM is quite a bit different than how it’s traditionally done as well. Normally, the design of the chassis is the first priority with hardware following in based on the capabilities of the chassis. With the Syber Vapor SLIM however, Syber is building out the internals first to ensure there’s no issues with the type of hardware that needs to go in, then they’re designing a chassis around the internal design. This will ensure that Syber can put the type of hardware they want into the smallest possible chassis without issue. This is why the chassis still still an acrylic shell. Syber tells us the actual chassis that will come with the final product will be significantly different from what we see here. Pricing and availability is still unknown at this time. The second product on display was the Syber Vapor Stream which again is a very early prototype as well. Unlike the Syber Vapor, Syber Vapor Extreme, or the Syber Vapor SLIM, the Syber Vapor Stream is designed to stream games onto the big screen rather than run them locally. 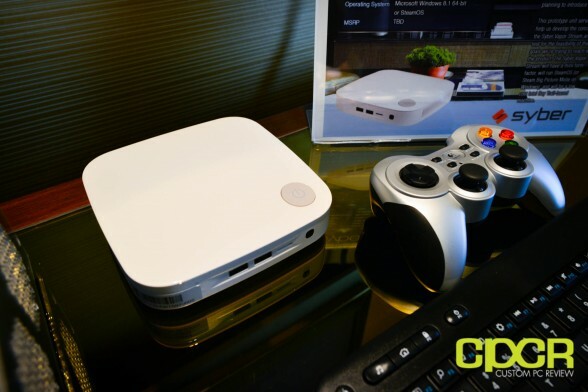 Unlike most competing streaming boxes however, the Syber Vapor Stream uses an Intel Bay Trail based Celeron J1900 processor, 2GB DDR3 memory, a 64GB SSD, and runs on Windows or SteamOS rather than Android or something else. While Android is a fantastic OS, it’s definitely not as robust as Windows, so depending on your needs, the Syber Vapor Stream could be a great option if you’re looking for something with a bit more functionality than just streaming and running Android apps.